Lawrence Kovacs, the head of the Gifted and Talented Program at RSU 1 (which includes the communities of Bath, Phippsburg, West Bath and Woolwich) enjoys working with a select group of students. But a couple of years ago he looked at the physical beauty around these Kennebec River communities and at the programs taking place at nearby Chewonki in Wiscasset and thought, “What can I do to get a big bunch of the kids throughout the school district out in nature together?” Not just the the Gifted and Talented group, but how about the whole eighth grade? 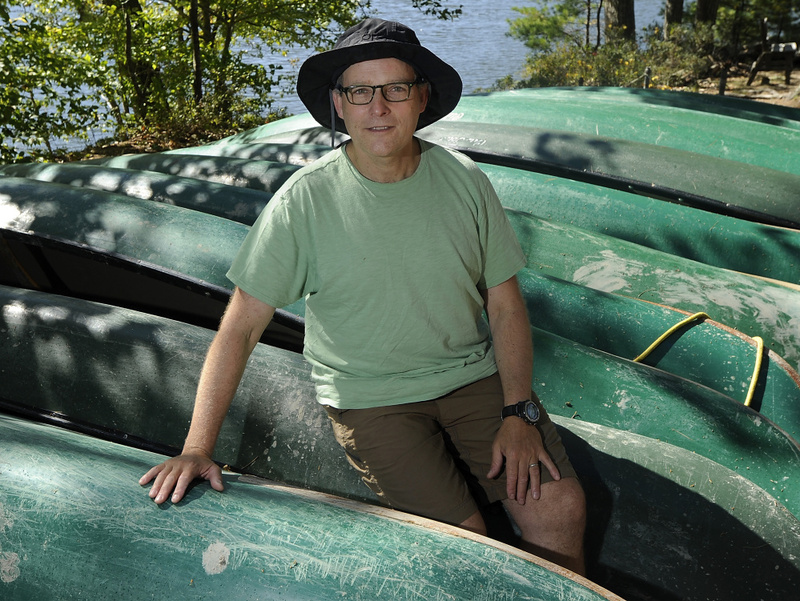 Just before he left on the second-ever F.L.O.W program (Fundamental Learning on Water), we called him to talk about canoes, experiential learning and the two hard, sad circumstances that motivated this groundbreaking program. SINK OR SWIM: Every eighth-grader in the district – there are 140 of them – is eligible for the trip, no matter their skill level on the water. “There are some kids who can’t even swim, and some kids who haven’t seen a canoe before.” Last fall the participation rate was 67 percent; this year Kovacs said it is 88 percent. The students are broken up into small groups, and the five-day trips happen over a five-week period beginning in September. They paddle around 5 miles a day, so it’s not overly strenuous, and camp on Oak, Berry or Castle Island on Hockamock Bay. They’ll write for an hour every day, read (shared texts that on the topic of exploration), draw, and get science and nature instruction from Chewonki counselors on tides, sextants, stars and the like. At the end of the trips, they’ll publish a collective journal. WHY RESIST? In F.L.O.W.’s first year there was some pushback, Kovacs said, including from some football parents who were worried that time away from the athletic field would be detrimental. There were also some complaints from the “tree-hugger-hating, hippies-smell-bad” kind of parents. After the trip, Kovacs said he had just one complaint from a parent – over the lack of a flush toilet. “It was a pretty astonishing success. A lot of kids came up to me and asked if they could go again.” One girl who hadn’t wanted to go in the first place told Kovacs her goal was now to work at Chewonki when she’s older. THE BIG BUCKS: With the exception of the lack of glamping-style toilets, this all sounds as if it could be pretty expensive; Chewonki-style experiences aren’t cheap. What’s the price tag? “It is really cheap. Fifty bucks for the week.” Wait a minute, how can that be? Kovacs drummed up support from Chewonki (which supplies all of the group camping equipment, from dry bags to sleeping mats, and handles the food), the charitable organization Davenport Trust and two area banks, Bath Savings Institution and First Federal Savings Institution. The eighth-graders are to bring rain gear and a sleeping bag. If they don’t have a sleeping bag, Kovacs said, the Bowdoin Outing Club has volunteered loaners. TURNING POINT: “Then I got skin cancer in 2013,” he said. “Melanoma. … I just started to think about what do I want to get done with this life? Let’s reprioritize the things that are really important.” He spent a year at Phippsburg Elementary School and then became head of RSU 1’s Gifted and Talented Program, which took him to all seven schools in the district. “I started to get this picture of how the system works.” He went to the superintendent. “I said, ‘I want to get a weeklong trip going for eighth-graders,’ and he said, ‘That is nice.’ ” Kovacs laughed. Surviving cancer motivated him but it wasn’t the only big force behind creating F.L.O.W. THREE LOSSES: The Phippsburg and Bath area had lost three teens to suicide in recent years and Kovacs was rocked by those tragedies. “It’s a small town,” he said. “Not that many people. Not to be indelicate, but it was a what-the-(expletive) moment for me. Why do these kids feel so hopeless?” And could they feel less hopeless if they spent more time outdoors in this beautiful place where they were growing up? Kovacs sold the idea to the banks as a community builder, telling them, “Do we want them doing doughnuts on people’s lawns or saying, ‘Wow, this is a beautiful place that we want to take care of’? Do we want kids to grow up hopeless or with aspiration?” These eighth-graders are, after all, likely to grow up to be bank customers. And the whole premise, to Kovacs, seemed like a no-brainer.